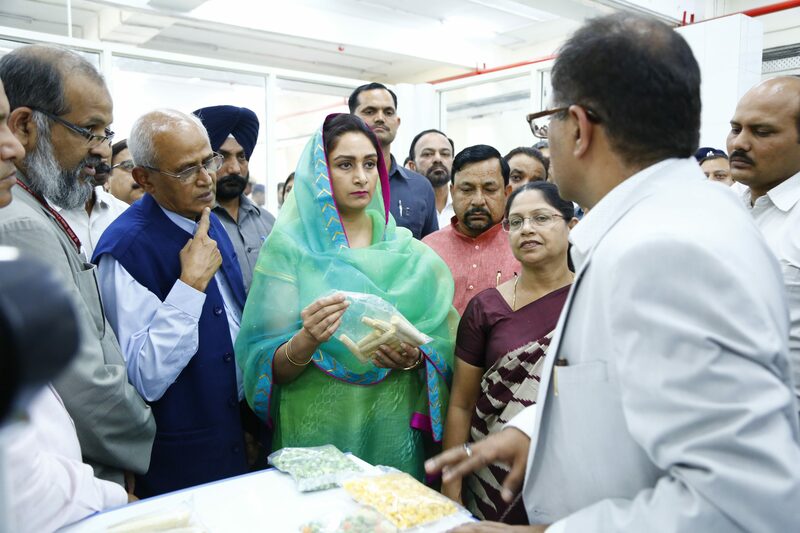 SONIPAT (Haryana): Union Minister of Food Processing Industries Smt Harsimrat Kaur Badal, while inaugurating the food testing laboratories here, said that NIFTEM should develop its own brand under which it could market the products developed at the institute. She said that the products would be cheaper, fresher and healthier than other products. She also said that the institute would become a centre for excellence. Speaking on the importance of the institute, the Minister expressed hope that farmers from nearby areas are able to learn processing and packaging at the institute. She also said that students from NIFTEM do not just learn theory but because of the industry partnerships, learn what the industry wants. At the ceremony, Secretary of Ministry of Food Processing Industries, Jagdish Prasad Meena said that the incubation centre will incubate entrepreneurs of tomorrow and will benefit the local farming community directly. Senior officials of the Ministry and NIFTEM were also present during the inauguration ceremony. NIFTEM is a national institute focusing on an integrated program on food technology and management education for developing a pool of professional managers with deeper understanding of the food and business to serve the processed food industry. NIFTEM also is spearheading the task of creating new entrepreneurs who are expected to venture into the processed food industry after identifying the opportunity areas. NIFTEM is attempting to create best facilities and provide innovative learning environment to provide one stop solution to all problems of the industry. NIFTEM’s pilot plant will serve the product development activities and test pilot production for business incubation for new generation entrepreneurs from both large and SME sectors. The facilities will help evaluating new products as well as new processes for better performance of existing industries. It will thus also act as research facilities for innovative products and processes and for modification of existing products and processes as well as for assessing new ingredients for improvement in terms of cost and quality. And finally provide training to students and industry personnel.